In May 1970 the annual NATO recce exercise “Royal Flush” was organized at the Dutch airbase of Deelen (now closed); participants were : USAFE (26TRW and 10TRW) with RF-4 Phantoms, BAF (42 sq. 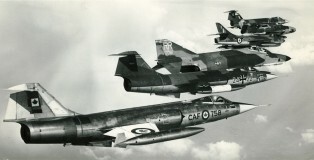 )with Thunderflashes, CAF (1 CAG) flying CF-104G Starfighters, R.Dan.AF (729 Esk) with Thunderflashes, FAF (ER 33) , Luftwaffe (AKG51) with RF-104G Starfighters, RAF (31 sq.) and R.Neth.AF/K.Lu. (306 sq.) thatwas equipped with RF-104G Starfighters. On May 14 Frank and Hans were allowed to pay a visit. 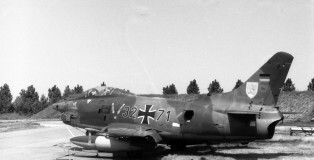 The 1969 TWM (NATO Tactical Weapons Meet) was held at Fliegerhorst Nörvenich in Germany. Participants to the Meet came from 311/312 squadron(K.Lu. ), 10W (BAF), 11 Escadre (FAF), 53 TFS/36 TFW and 20TFW (USAFE), 1AD (RCAF), JABOG 33 + LeKG43/44(Luftwaffe) and 3 sq. (RAF). Referees were flying German TF-104Gs. Frank was present and took the pictures in this gallery.